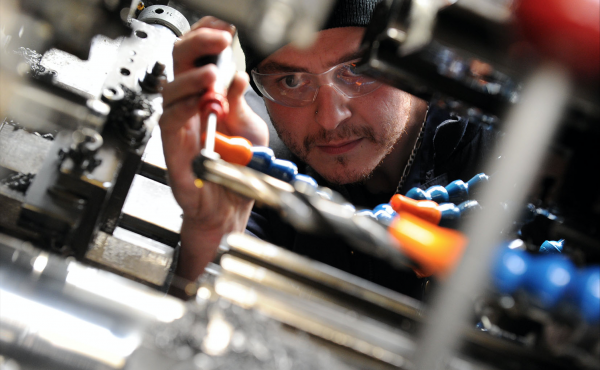 The National Manufacturing Barometer is back and paints a picture of SME growth, yet a disconnect with UK Industrial Strategy. Small to medium sized manufacturers in the UK have remained resilient in the face of ‘Brexit’ uncertainty, with 57% of firms recording an increase in sales during the last six months. 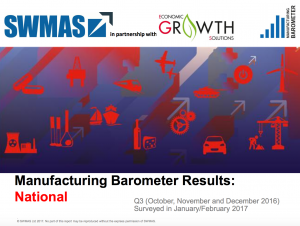 The National Manufacturing Barometer, conducted by SWMAS Group in partnership with Economic Growth Solutions (EGS), also found strong optimism for growth, with two thirds expecting sales to grow again during the first half of 2017. Senior decision makers from 270 companies across the country provided an insight into life on the shopfloor as part of this latest report. Half of those questioned revealed that they plan to invest in new capital equipment and technology going forward, whilst 46% plan to increase their workforce to cope with demand. Another key finding is that a surprising 42% of respondents say that don’t know whether the UK Industrial Strategy is built to deliver their business needs, clearly showing there is a lack of visibility and understanding amongst SME manufacturers. Simon Howes, Managing Director of SWMAS Group, commented: “There has been a lot of talk about uncertainty around the impact of Brexit and the possible impact it could have on manufacturing, which makes the positive results from the latest Barometer very welcome. The UK’s Industrial Strategy was the special focus of the National Barometer and it revealed that the majority of small to medium sized manufacturers were not convinced the Government had yet delivered a vision that matched their requirements. Just 17% of respondents agreed that the direction of the industrial strategy would work, which highlights the need for much better engagement with SMEs and stronger communication about the plan and what it involves. When asked what should be the main focus for the UK Industrial Strategy, R&D and Productivity were high on the priority list, closely followed by access to growth opportunities within the UK, export and operational skills. Lorraine Holmes, CEO of Economic Growth Solutions and the recently launched Manufacturing Growth Programme, added her support. “Our SMEs are giving a strong message to Government. They need to feel that the new strategy reflects their aspirations and will support them in making the most of new opportunities and overcoming some of the challenges they are and will continue to face. The Manufacturing Barometer is the largest survey conducted of SME manufacturers in the UK and asks senior decision makers for their views on business performance, future trends and Government policy.